We finished up our STAAR tests last week, and I spent the bulk of two school days with students in my testing group. I only knew a few of them before that happened. As soon as they were done on the last day, I turned in my materials and began ripping off the colored butcher paper that covered any instructional signage. I must have had an evil gleam in my eye because the kids were delighted by my vigor. In fact, I felt so energized that I read from one of John Erickson’s Hank the Cowdog series with character voices for Hank, Drover, Pete the Barncat, etc. They were laughing in all the right places, and I was laughing, too. I found out later that they now think I’m “cool.” That’s nice. I have the blessing/misfortune to live near where I teach. It means I don’t have to leave as early as my counterparts who reside farther away. I am a private individual when at home, and I don’t do things to attract attention to my home other than try to keep my flowers and lawn growing and the weeds dying. I am never quite sure how to respond to kids riding by (and in the case of this weekend standing astride their bicycles openly staring at/watching me as I carried a lawn bag around to the trash!) because I value my privacy. I have had to explain this to more students recently than ever before. When I am at school, I will help out or answer questions. When I am at home sweeping my front walk, looking at the yard, or getting the mail, I am a private citizen and pretty much off-limits. I know this may sound uncaring, but as a natural introvert, I need that time alone to think and be the wonderful, fabulous Mrs. Johnson that they know and love. If I don’t get my down time, then I am not as upbeat. It should go without saying that if a child is in danger, I will gladly help them and be a safe place/person. No one bothers my kids! I’ve had former students who knew exactly where I lived, and it was not a problem. I just want that trend to continue. Last year, we were ding-dong ditched repeatedly by some students who thought they were funny. They weren’t, and I reported their names to the school resource officer. Two years prior to that found me being followed by a former student riding along in a car as I was walking for exercise during the first week of summer vacation. I was shaken as I hurried home taking alternative routes and going guerrila stealth mode. I value my students’ privacy, too. I have a good idea where some of them live, but I don’t stop by and visit. I’ve dropped off homework or personal items left behind after calling their parents to notify them of my impending visit. My team mates and I write positive postcards and sign birthday postcards then address them before posting them. At the end of the school year, I look up their addresses to write thank-you notes when they’ve managed to slip out of the building before I can give them their note personally. I am only Facebook friends with students who have graduated from high school. There are several requests sitting in my inbox, but I won’t be clicking “Confirm” until that happens. This is my way of protecting both parties because there is no hint of impropriety from me, and I control the information I put in a social media forum. My posts are pretty much G-rated all of the time because I am predictable about what I write – exercise, meal plans, etc. I do have a students-only email address that they can use to keep in touch with me after leaving my class. I ask about hobbies, books read, classes in their new grades, family, etc. It’s a continuation of our conversations in the classroom and no more. I encourage them when I see that it’s needed and write recommendation letters when asked. I guess the best way to sum it up is that I like being in control of my own press and reputation. I like controlling what comes across or is read; however, I know that isn’t always possible. I keep on going anyway. I was updating my list of students who’ve been in my class, and it’s kind of overwhelming. I would love to find every single name of every single student I’ve had in class, but I don’t believe I have that information in a database. I’ve got over 700 names that I know of; however, I know that the number is much higher. I wish I’d thought of this sooner. I find myself remembering names and adding them on the list, so the number keeps growing. I’ve included some non-students in the listing, too. They are students who made me love them with our interactions in the hallways at school even though I was never a teacher of record for them. I have been truly blessed in my teaching career!!! 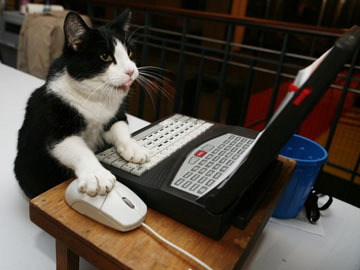 (Note, this is not my cat, but I like the picture as it reminds me of me!) More anon. At times I feel maudlin and insignificant in the grand scheme of things, then I must pause and tell the truth. I do some good things each day I am in the classroom with my students. 1. I say “Good morning” or “Good afternoon” each day to my students as they enter the room and then once again as I start my class. 2. I post the agenda on my projector screen in the form of a PowerPoint. It’s there every single class period. 3. I grade papers in a timely manner and post my lesson plans each week as required. 4. I attend baseball games and some school-sponsored events that my kids attend just to lend them support. Their eyes light up when they see you are there for them on your own time. It’s a win-win situation because you never forget them, and I’ll wager they never forget you either. 5. I keep my classroom blog regularly updated with information for my students and their parents. 6. I walk nearly every day in the morning before school because it keeps my mind clear of cobwebs and makes me happy. 7. I dress professionally daily and don’t always wear jeans when permitted. As a result, I stand out and appear different. I am different because that is how I am wired. I like looking nice at work even if no one tells me that I look nice, I know I’ve made myself feel good. Don’t let the title fool you. I do care. I care a great deal. I just hide it from my students at times. I refer to the attitude of a student who doesn’t make the grades necessary to pass the class, and then has the gall to show up with a laissez-faire attitude. It’s not “Laissez faire les bon temps rouler” time when you come to my class. It just isn’t. Around this time of year, standardized testing is a major focus for most people involved in education. That small percentage who don’t really care occupy over ninety percent of my tutorial time. “We’ve got to find something to get little Jimmy Badboy* interested in school.” Jimmy Badboy doesn’t give school work two seconds of his time once he leaves the building, so why do I care? I care because I value my reputation and my low failure rate. I take failures personally. I want to ask Jimmy Badboy when it became acceptable to fail. I want to shake his disinterested, narcissistic parents and dash their iPhones to the ground. Maybe that will get their attention. I want to scream, “How DARE you bring anything less than your best into my classroom?” Taylor Mali said that in his book What Teachers Make. It was worth reading and savoring. I may have to check it out from the local library again and ponder it over the summer break, but we’ll see. My most notorious student ever! I don’t sleep as long as I do during summer and longish school vacation times. I wake up at 3:30 A.M. sometimes thinking about a new idea or technique to handle a Jimmy Badboy. I want to take him home and be his mother because I just know I could change him for the better. I just know that with my love and discipline (routine!) that he would thrive. He would become intrinsically motivated and give up the dream of shifting along and existing. I’ve put some Jimmy Badboys into my car and drove them home without a complaint. They would stop by and ask if they could have a ride. The answer was always yes. While one of my Badboys was in the backseat, he took exception with another driver and flipped him off. I saw this in the rearview mirror and was horrified. “Don’t ever do that!” He grinned at me, and I shook my head. I actually took him to church and then out to lunch afterwards. He was quite well-behaved because he knew I cared about him and that I believed in him. I see my Jimmy Badboys sitting in the office waiting to see the principal, and my shoulders sag in sadness. I do care, and anyone who thinks otherwise needs to look at the world through my sleep-deprived, sandy-feeling eyes and get a grip on reality. I care, and this is why I get up each and every morning to go to school to be with my kids. I am tough as nails on the outside only because I tend to be a “softie” on the inside. Tell anyone, and I will deny it to my dying day. *Note that Jimmy Badboy is a compilation of various individuals I have met in my educational career and is not reflective of any single person, living or dead. Any similarity is coincidental. 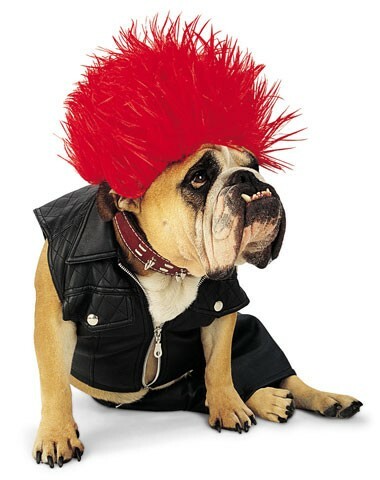 I had to put a picture of a punk rock bulldog on to give my topic a little humor. More anon.